In August, I spent 4 days at the Greenbelt Festival outside of London, which focuses on progressive social causes, music and art. I worked with a group of volunteers to create an interactive mural on a long wall in the entrance of the event, and we welcomed festival- goers to participate in the creation of the piece by adding their poems, drawings and messages on the colored geometric shapes. The theme was the environment; participants were asked to reflect on what we— as individuals and as communities— can do to begin the healing process and reverse the damage done to our natural environment. The wall quickly got filled up as enthusiastic people of all ages and from a variety of countries and ethnicities got inspired to add their voice to the wall. Everyone seemed passionate about at least one aspect of this issue, whether it be the pollution of our water and air, the dramatic effects of climate change, the shocking rate of animal species becoming extinct, the cutting down of rain forests or many others. It was amazing to see small children painting with their parents and elderly people participating alongside teenagers, everyone excited to be part of the creation process of a giant work of art. Thanks to all the volunteers, participants and the organizers of Greenbelt for welcoming me and supporting the mural project! After the festival, I got to work on a new series of pieces on canvas in London. I also headed out to Vienna, Austria, where I was invited to the Levin Jam urban arts festival. Thanks to the Levin Statzer Foundation and my friend Isabella Schrammel for hosting me! Getting started on the Greenbelt mural! 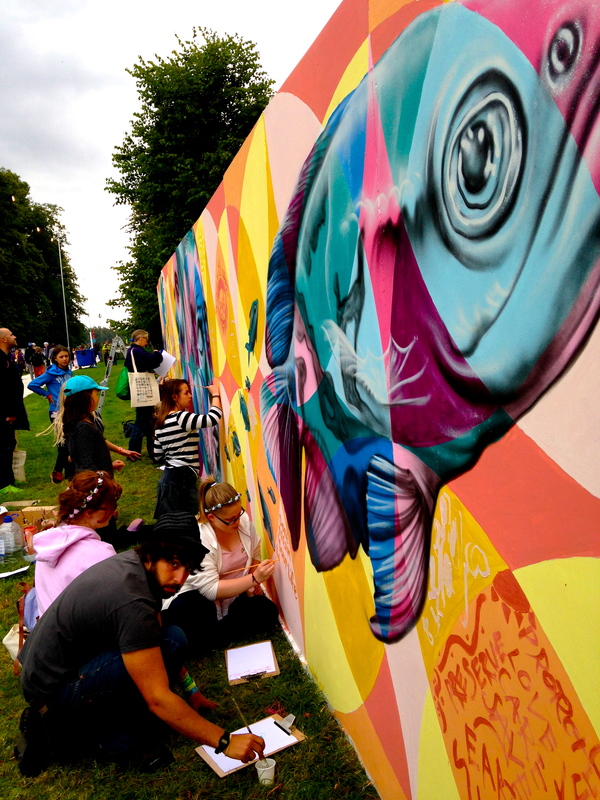 Festival-goers work on the mural at Greenbelt in the UK. UK, 2014: Joel created an interactive mural as part of the Greenbelt Festival outside of London, which focuses on progressive social causes, music and art. Joel’s piece was prominently featured along a long wall in the entrance to the event, and festival- goers were invited to participate in the creation of the piece by adding their poems, drawings and messages on the colored geometric shapes. The theme was the environment; participants were asked to reflect on what we— as individuals and as communities— can do to begin the healing process and reverse the damage done to our natural environment.